We have a huge family really, there are 9 of us, so birthdays come along pretty often. Today is the turn of my partner, and we were out today at a fabulous picnic organised by Roberts Bakery (more about that later), so yesterday was a baking day. I made a simple sponge (weigh your eggs, take the same quantity of sugar and butter and cream together, add the eggs, add the same quantity of self raising flour, 20 minutes in the oven at 180C), but I used dark brown sugar and golden caster sugar and added plain chocolate chunks because these are things he really likes. And I bought him a lovely Game Of Thrones t-shirt for his birthday with absolutely no idea that the print on the front completely gives away what happens in the book he's only just started - doh! Thankfully he has forgiven me....although I'll never live it down! I'm bossy like that! 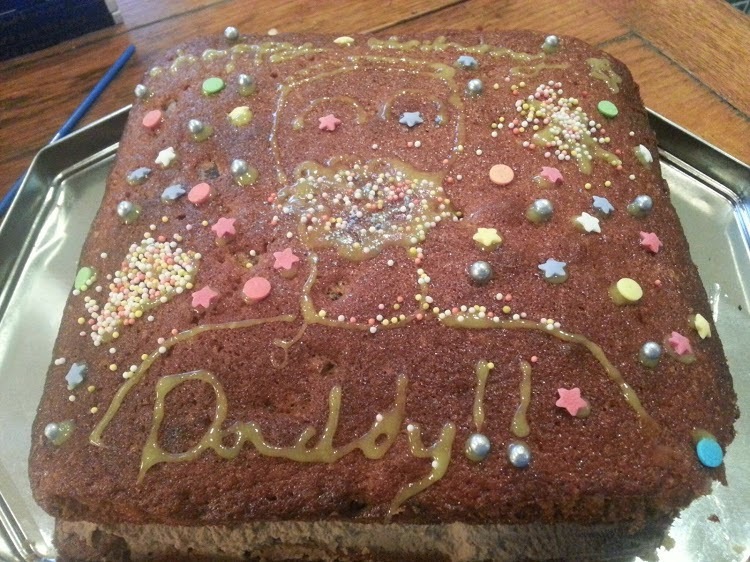 Thanks for entering #Bakeoftheweek - I did larf at you giving the plot away with the t-shirt! :D In November we have 3 birthdays within 3 weeks - even we begin to get bored of cake after that! Love the cake - it's great when the kids get to design it themselves, hope he had a good birthday!